Mike graduated from Columbia University in 2000 with a BS in Electrical Engineering and a MS in Electrical Engineering from Virginia Tech in 2002. 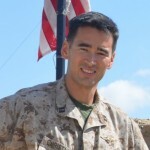 He worked as an engineer for several years in Washington DC before leaving his job to join the Marine Corps, eventually becoming an AH-1W SuperCobra pilot and JTAC. He served on the 31st MEU in southeast Asia and twice in Afghanistan. In Afghanistan Mike flew attack helicopters and was later embedded with a battalion of soldiers from the Republic of Georgia while with 1st ANGLICO. Mike began his MBA at the University of California Berkeley’s Haas School of Business in the fall of 2014, and is a member of the 2014 Class of Pat Tillman Foundation Military Scholars.